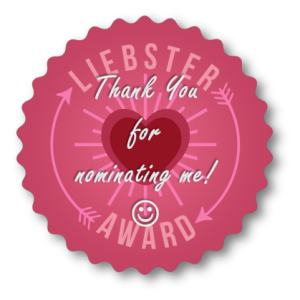 If you haven't seen the Leibster Blog award floating around, it's an award that helps generate some buzz to your blog as well as other bloggers I was nominated last month by Christina, and now by Rosalie. Thank you to these lovely ladies. Although I was nominated last month I never got around to responded, and quite frankly was a little confused about it... but now that I've seen it around, I think I've got the jest. The nominees must link back to the blogger who nominated you. Nominate 11 new bloggers (with under 200 followers) & make 11 new questions for them to answer. Although I already mentioned them, both Christina, and Rosalie deserve another mention! I have "virgin" hair... as I've never dyed it! I have an OCD that involves pillows. I do a pretty mean English and Irish accent... well try to at least. I can honestly say I'm in love with Robert Sheehan. My bestfriend is a straight guy named Justin... IT IS POSSIBLE! My mother calls me Lala, while my sister calls me Bubbie... embarrassing I know! I have a certain naive-ness to me, that makes me want to see the good in people, even when its not there. I'll eat any cake, even if I don't like it... just because I LOVE cake. Those were fun to think of! As two ladies nominated me, I shall answer both their questions! 2. Do you prefer to read books or magazines? Which is your favourite of each? -Books! The Giver by far is my favorite book. I like Elle magazine. -December 3, 2012.. not long at all! 4. Name your 3 favourite things you got this year for Christmas? -New Bedding, new curtains... and makeup! -In a happy place, having made more definite decisions about life. 7. What's your favourite perfume at the moment? 8. If you could only eat one item of food for the rest of your life, what would it be? 9. What would be you dream job? -Either a writer of some sort, or someone who helps at certain shelters..
10. Apart from blogging, what else do you do to fill up your time? -Watch films. Shop. The norm. 11. Who is your ultimate celeb crush? Now for Rosalie's Questions: 1. If you could only eat one meal everyday for the rest of your life what would it be? -CAKE! It's not a meal... but I'd make it one! 2. What is your favourite city that you've visited or that you'd like to visit? -I live in Atlanta, it's a great city... and since I've only traveled the country side of the south I'll have to go with that! 3. Favourite Beauty item? -Mascara! 4.If you could change one thing about your life what would it be? -I would have my own place! 5.Coffee or Tea -Cofee. 6. Do you collect anything? -Makeup, if that counts! 7. Is there a natural phenomenon in the world you've always wanted to see or go to? (e.g the northern lights or the grand canyon etc.) -The Hedge Stone thingies in I believe Ireland? Yeah, they sound cool. 8. What is your starsign? Do you believe it means anything? -I think that means my zodiac, well I'm a leo! Sometimes I do believe them, sometimes they are sooo wrong. 9.Favourite Item of clothing? -Any type of sweater. 10.What is something you are passionate about and why? -Advocacy of gay rights. I'm "straight but not narrow"... I just think everyone deserves happiness, and someone else can't tell them who they love is wrong. 11. Who inspires you? -Lily Collins, Miranda Kerr, and Lauren Conrad. If given the opportunity to attend a festival, or award show (i.e Sundance, Grammys); where would you go? How long could you live without beauty products? Favorite thing used daily, it could be beauty, food or whatever related! What is the biggest Goal you'd like to achieve this year? One thing you would change about your personality? This was great fun, look forward to more things like this in the future! i agree with the mascara thing, rarely leave home without some! Aww thanks so much for the nomination! Lovely to know more about you, we definitely share a love of cake! Hello, I just stumbled into your cute blog!! I love tag post! You get to know a person, well sorta! Dalia! Thank you so much for nominating me for this award! I know you said you were confused with it as first, and as I am still new to blogging I am still not exactly sure what this is about, but I will read into it! Thank you again! Great answers, I love The Notebook too but it makes me cry so much!